Maria "Movita" Castaneda (April 12, 1916 – February 12, 2015) was an American actress. She was known for being the second wife of actor Marlon Brando. 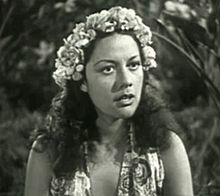 She was known for her roles in Flying Down to Rio (1933) and Mutiny on the Bounty. Castaneda died in Los Angeles, California from complications of a neck injury, aged 98. ↑ "Movita Castaneda dies at 98; film actress was Marlon Brando's second wife". LA Times.com. Retrieved February 17, 2015. This page was last changed on 17 February 2015, at 12:59.